Monthly average balance (MAB) of an SBI savings bank account is the average of daily balances in the account in a month. 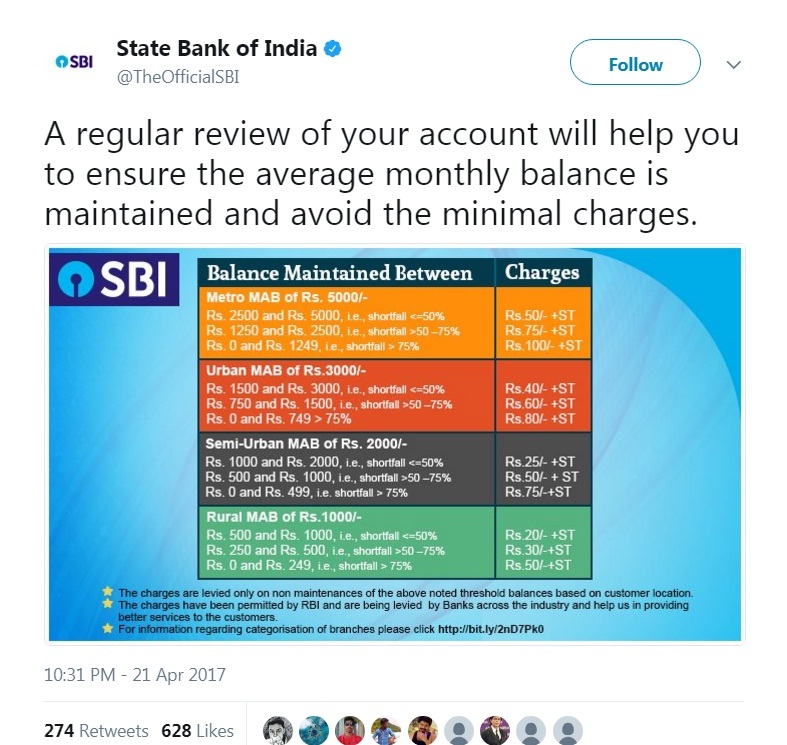 State Bank of India charges a penalty up to Rs. 100 (excluding service tax) on its savings bank account holders for not maintaining the Minimum Required Balance under its monthly average balance or MAB rules. The fine for not meeting the minimum average balance in savings bank accounts each month is levied on the basis of branch location. This was said by India's largest bank SBI on microblogging site Twitter. That means customers holding savings bank accounts in metro, urban, semi-urban and rural branches of SBI need to pay different penalty amounts for non-compliance. The amount also varies on the percentage of shortfall each month, according to SBI's website. SBI has specified various ranges of shortfall for its savings bank customers according to the four categories of branches. 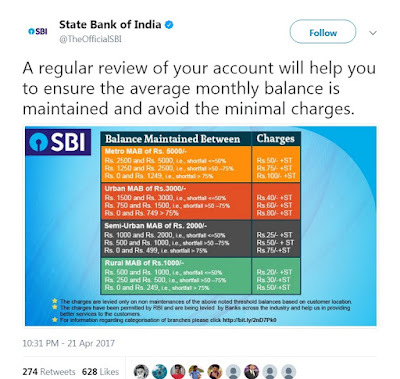 "A regular review of your account will help you to ensure the average monthly balance is maintained and avoid the minimal charges," State Bank of India (SBI) has said on microblogging site Twitter. In case the monthly average balance of an SBI savings bank account holder comes out to be between Rs. 2,500 and Rs. 5,000 - a shortfall of less than 50 per cent, a charge of Rs. 50 plus service tax will be levied, SBI said. For those with a shortfall of between 50 and 75 per cent (MAB from Rs. 1,250 to Rs. 2,500), a fee of Rs. 75 plus service tax will be charged, and Rs. 100 plus service tax for those keeping an average less than Rs. 749 (more than 75 per cent shortfall). The charges have been permitted by the Reserve Bank of India and are being levied by banks across the industry "and help us in providing better services to the customers", SBI added.